With the introduction of new economic reform policies, commonly known as adjustment policies associated with the World Bank and IMF. These policies have been hailed by some as the most promising ones to make economies like that of India into a tiger and at the same time criticised by others as a signal of derailment from the Nehruvian path of planned development and welfare in India. 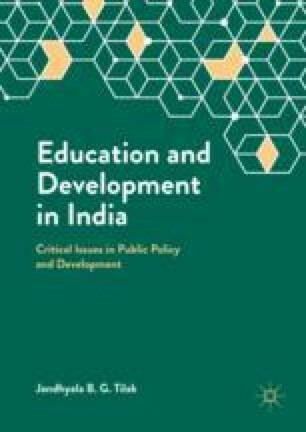 With the help of some readily available data collected from UNESCO, World Bank and recent studies, a few comparisons are made in this chapter between eh ‘adjusting’ and the ‘non-adjusting’ countries in the development of education. The aim has been to examine whether there is any discernible difference in educational development trends between the two sets of countries. For this purpose, a select list of indicators of education development has been chosen, concentrating on the allocation of financial resources, growth in enrolment ratios and on quality and equity in primary education. Published in Prospects (UNESCO) 27 (1) (March 1997): 85–107; expanded version in Education, Development and Underdevelopment (eds. : Sureshchandra Shukla and Rekha Kaul), Sage, New Delhi, 1998, pp. 99–137. © UNESCO and Sage Publications.